In this work, we report the fabrication of an optical waveguide by single-energy H+ ion implantation in the Er3+-doped phosphate glass. The ion implantation conditions are with energy of 0.4 MeV and a fluence of 8.0×1016 ions/cm2. The dark mode spectrum of the waveguide structure was measured by the prism coupling experiment. The refractive index change along with the penetration depth was fitted by using the reflectivity calculation method (RCM). 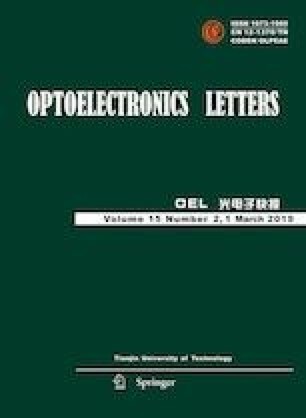 Finally, the calculated near-field light intensity distribution shows superior waveguide properties, which demonstrates its promising potentials for compact optical integrated devices. This work has been supported by the National Natural Science Foundation of China (Nos.11405041 and 61505084), and the Natural Science Foundation of Jiangsu Province (No.BK2015084). Ziegler J. F., SRIM-The Stopping and Range of Ions in Matter, https://doi.org/www.srim.org. Rsoft Design Group, Computer software BeamPROP ver sion 8.0, https://doi.org/www.rsoftdesign.com.